My overall impression is that these respondents were looking for ways to handle care at home, and they were looking for both skills and services that would help them do it. They did not consider that reading books or seeing videos would help them as much as attending a training program on caregiving skills. They didn’t think support group meetings would help as much. And they were not considering day care/ respite care as actively as improving their ability to take care of the patient at home. After all, home is where care begins. Unfortunately, as an individual volunteer, I am not in a position (and lack the time and energy) to arrange training courses myself. If an organization arranges a course, I conduct sessions as required. I hope that organizations that arrange dementia caregiving and dementia management trainings will arrange trainings for caregivers more often, because people clearly want to be trained. We also need trained attendants (persons trained to look after dementia patients). People use various terms for them, like ayahs, home help, home caregivers, even dementia nurses or dementia aides, but these are really paid helpers who will stay with the patient for several hours (or even the whole day) and know enough about dementia to effectively handle the behavior challenges like agitation and wandering, without getting flustered. Again, we need organizations who arrange the required trainings. People like me are available to help conduct sessions. My personal experience has shown me that, given how unreliable attendants are, we home caregivers fare better if we can train the attendants ourselves for dementia-specific care; I have done this for the attendant I use, and it worked out well. I know a few others who did so, too. I am considering preparing “training material” that home caregivers can use to train attendants for dementia care. Any ideas, anybody? I was sorry (though not very surprised) to see that dementia/ caregiving books and videos did not rank high. I can quite imagine that a dementia workshop, with faculty and role plays and an opportunity to interact and ask questions is more engaging and effective than reading a book. But again, there is a limit to how many such training workshops can be held, and at which locations. This makes me wonder whether part of the problem is because existing books and videos are not very interesting or relevant. Most currently available material is prepared for a Western culture. I wonder whether better made videos, made using India-based examples, and with suitable pictures and examples would help. Again, I invite ideas on how we can make material (books, videos, pamphlets) more engaging and effective for caregivers in India, because we have to reach out to large numbers, and training a few dozen people twice a year in a large metro cannot suffice. Very few cities have any dementia training programs, and the few cities that have them, hold them once or twice a year, for a limited class size. This is just not enough. We need every possible way of reaching out to everyone who needs help. I try to reach out through is my website, where I present information from a caregiver perspective. The website is extensive, and full of information particularly relevant for dementia care in India. Given that many people are not web-savvy, the usefulness of a site is limited, but every bit helps. Here’s the frightening fact: the numbers are daunting. 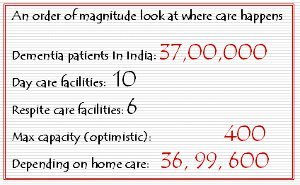 There are, as per estimates in the Dementia India Report 2010, 37 lakh dementia patients in India, and there are only 10 day care centres in India, and only 6 respite cares, and most have very limited capacity, typically 10 to 20 for day cares, and less than 100 for respite cares. Home care is what most caregivers will end up doing. Given this, it is perhaps good that not everyone is looking for day care and respite care, because there is a limit to how many people can be helped through such services 😦 On the other hand, if more people are aware of day care and respite care and demand such services, I hope it will result in more such facilities will be created. But for now, there is no doubt that we have to find ways to help caregivers with home-based care for dementia patients. The arithmetic demands it. As I said earlier, I began my data analysis on March 15, based on 17 responses received till then. I will analyze the next “batch” of responses after the next tapering off, or I’ll never get this post complete. Please share any thoughts you have (as comments here, or by writing to me). I look forward to hearing from you. Thank you for this, the findings clearly point to possible ways forward. They are also corroborative of the possible implications based on responses to our Caregivers Survey. It appears that whether caregiving takes place in one set of circumstances or in another, the needs are the same.